Two wonderful weeks of rest, work, and sharing wholesome food at Albergue Verde. About six weeks ago, we passed through Hospital de Órbig o in search of Albergue Verde, one of the generous establishments that agreed to host us in support of our project. After following the “snail” signs through back streets of the town, we arrived to welcoming arms and immediately knew it’d be a place to come back to. The nourishing vegetarian food, large garden, easy going atmosphere and big hearts of Mincho, Velas, Miriam & Andrea are just a few characteristics that make this place so extraordinary. 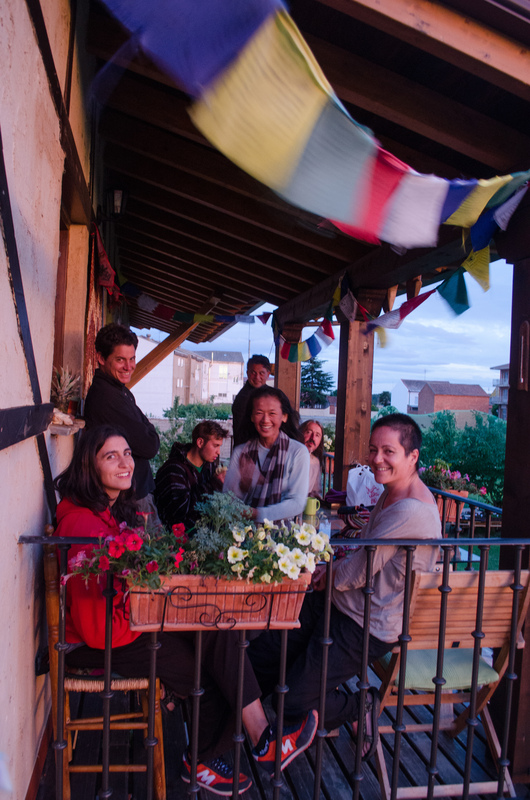 And thus, to revive our bodies between spring and summer caminos, we returned to Albergue Verde as “hospitalieros.” Our hands have washed sheets, worked soil, welcomed pilgrims and cooked meals. We’ve exchanged knowledge, recipes, songs and stories. But the best part has been creating a home away from home. We were lucky to find such people who share similar values, particularly regarding food. Miriam, the amazing wonder-woman head-chef who does it all, prepares a full menu for pilgrims six days a week. The meal, donation based, includes bread, soup, salad, entrée, dessert & tea. When most pilgrims discover the meal is vegetarian, they sigh with relief and appreciation. Although the fresh breads, sharp cheeses and fine cured meats found along the Camino can be a fantastic experience of Spanish cuisine, it’s not easy to find alternatives. Miriam, hard at work. Although the “kitchen of love” is tiny, there are endless possibilities. Table set for hungry pilgrims. One of Miriam’s famous vegetable creams. Fortunately we’ve had multiple opportunities to cook for the albergue. Concocting a full course meal for many can be a slightly daunting task, but as Miriam says, “If you do it with love, everything will taste good.” And it’s true. Of course, we tried to incorporate at least one wild food into the menu. Our latest experiment: Stuffed zucchini topped with champiñónes and alfalfa salad on a pillow of white bean cream. Our plant of choice: Alfalfa – Medicago saliva. Highly nutritious and super delicious. Courtney Jean separates the leaves from the stems. Prepping the stuffing – a mix of nuts, herbs, squash, mushrooms and alfalfa. Marinated in soy, lemon and olive oil. Topped with champiñónes, waiting for the oven. Served with red pepper rice. Buen Provecho! During the meal, one pilgrim thanked us saying, “I can really taste the joy in every bite.” Compliments such as this fill us with the satisfaction of nourishing fellow human-beings with wholesome food. 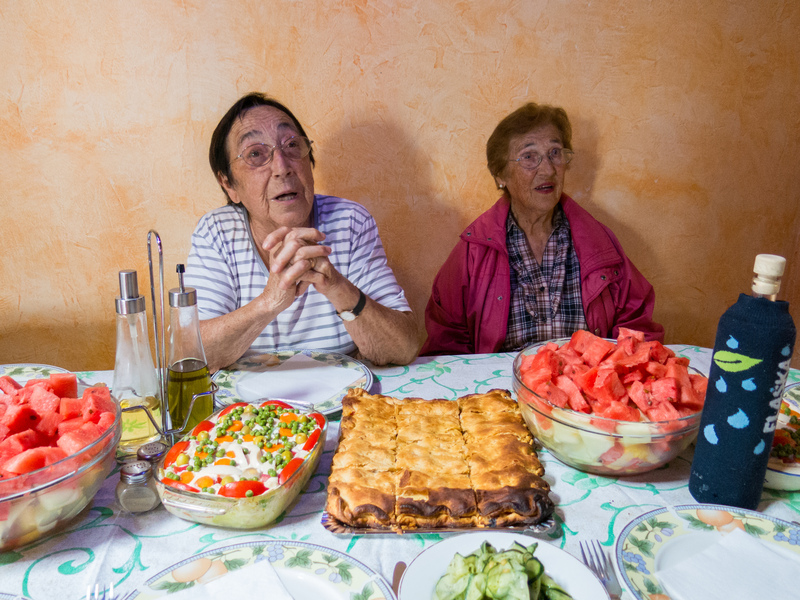 A daily tradition at Albergue Verde is to bless the meal with song. The lyrics, written below, help us recognise the energy needed to produce our means of sustenance – from seed to basket and pot to plate. The blessing of the food. Mincho with his tabla drums. Enjoying the post-dinner sunset and tea. The Edible Camino is now available for purchase! Project update: we’re still here!